Aurora Borealis Lodge and Chalets are just 20 miles north of Fairbanks in the famed Cleary Summit area. 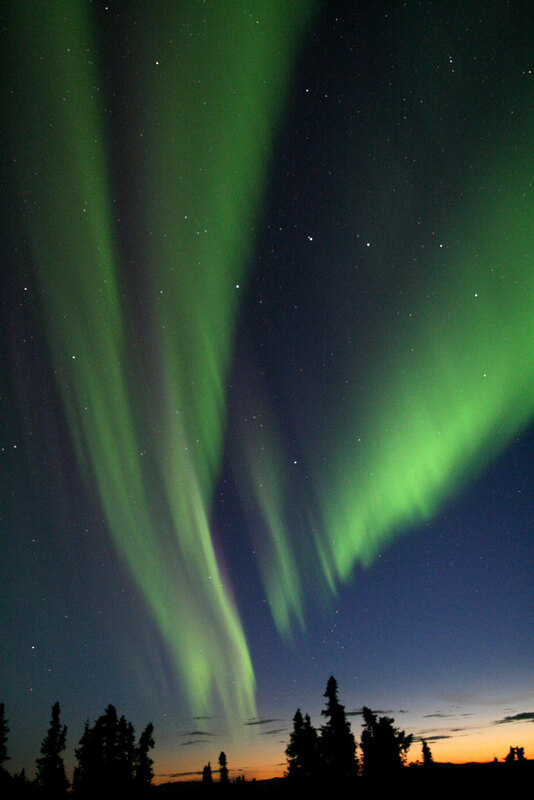 Our location is known locally and internationally as one of the best places to view the northern lights in the world! We are away from the light pollution of Fairbanks city lights, and above the ice fog that can form during deep cold nights. From high on a ridge, we have unobstructed views of the northern skies. Our large north facing windows of our rooms offer optimal viewing conditions. Come join us for a chance to view the beautiful lights in the sky! We are open during the optimum season for viewing the Aurora in Fairbanks, from mid-August through mid-April. Our tours are scheduled for the best times for Aurora Viewing. The Northern Lights are usually most active and visible between 10:30 p.m. and 2:00 a.m.
SpaceWeather.com Space weather news, alerts, books. Auroral Activity from NOAA POES satellite passes. Live Aurora Web Cam at Poker Flats Research Range just 6 miles north of the lodge. Today’s Space Weather from the Space Environment Center in Boulder, Colorado. SOHO — Solar and Heliospheric Observatory A spaceborne solar observatory. Solar Terrestrial Dispatch maps of the auroral oval and radio propagation predictions. The Aurora Page from Michigan Technological University.